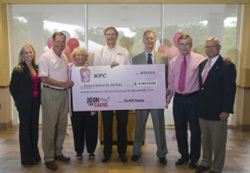 Executives from Susan G. Komen for the Cure visited KFC World Headquarters on August 23 to accept a check from KFC for more than $4.2 million. The money was raised by KFC franchisees and restaurant operators in April and May during the company’s “Buckets for the Cure” campaign. The total amount raised by the 5,000 KFC restaurants coast to coast was $4,249,539, which represents the single largest donation in the history of Susan G. Komen for the Cure. KFC dedicated special pink buckets to Susan G. Komen for the Cure, with KFC restaurant operators donating 50 cents for each bucket they purchased through May 9. Twenty-five percent of the funds raised from the promotion go directly to the local Affiliates of Susan G. Komen for the Cure. The funds are being used for local breast cancer education, screening, and treatment programs. During the campaign, KFC changed the color of its bucket from red to pink for the first time, temporarily lit its “White House” headquarters building pink, and even repainted a Louisville restaurant. The Colonel Sanders look-alike who represents the company even traded in his white suit for a pink version to complete the brand’s temporary transformation.